The Clients were a busy professional family with grownup children. 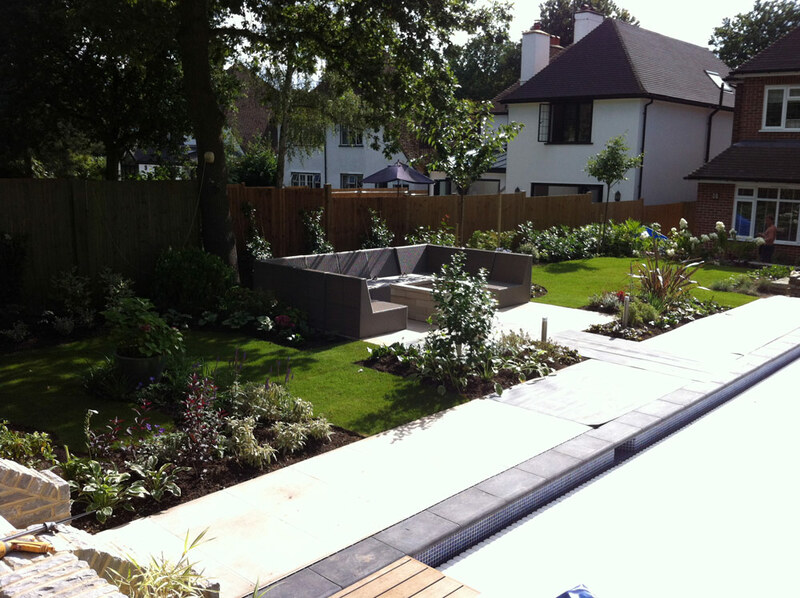 They wanted a garden that would act as an extension of the interior living space; somewhere to entertain their friends and have fun, and a beautiful place to relax in. 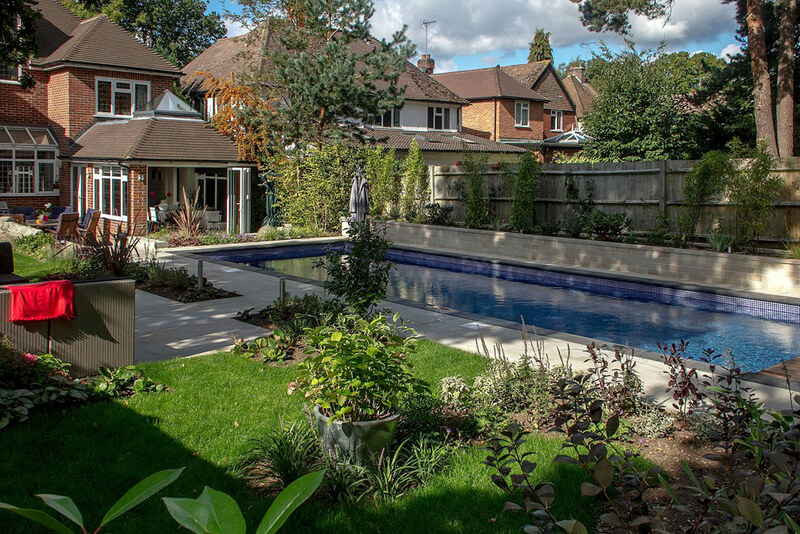 Two features to be factored into the design were a swimming pool and a gym. The site sloped quite steeply down towards the house with a mature oak tree that had to be taken account of in the design. There were a number of mature trees overshadowing the rear of the garden from neighbouring properties and an overgrown row of Rhododendrons took up one side of the garden. There were some beds present but they were tired and uninteresting. The design took advantage of the slope and is based on three levels. The lower level is the dining terrace and allows the open plan kitchen to flow straight into the garden, creating a garden room feel. 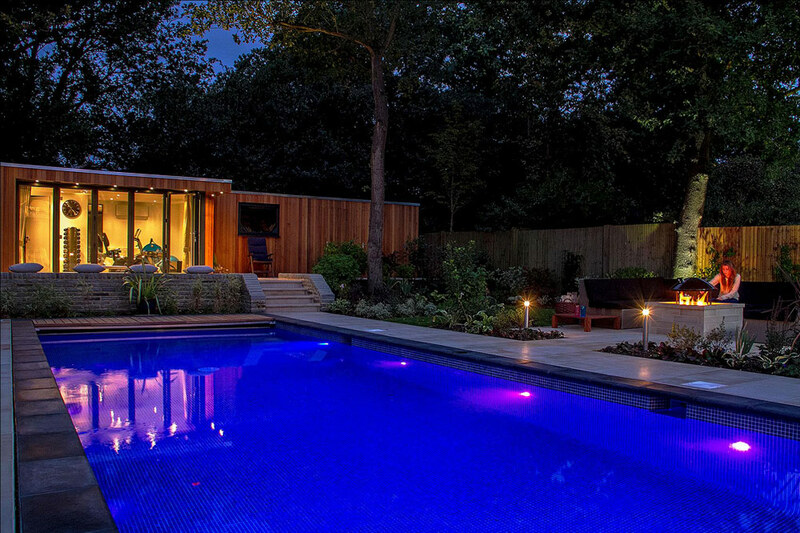 The middle level houses the swimming pool and an entertainment area with generous seating around a fire pit. 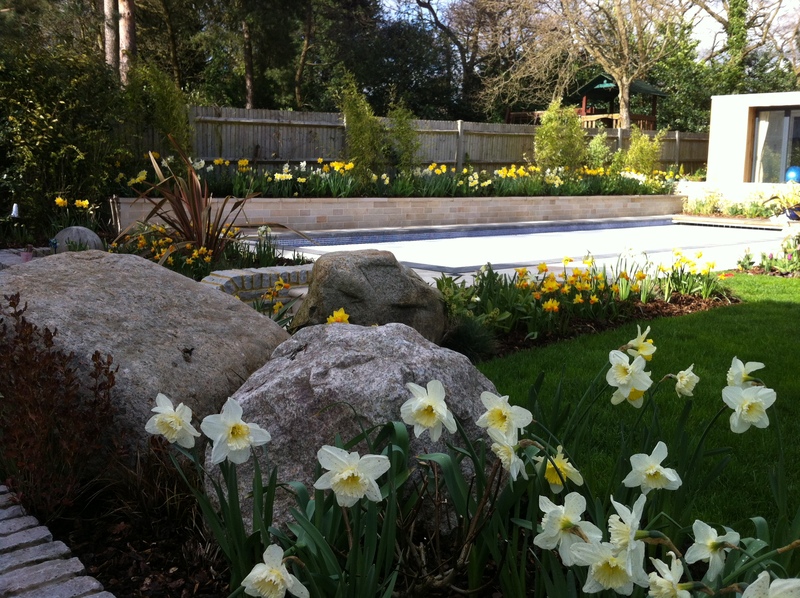 The flower beds introduce great interest through a wide range of colour, textures and scent, changing with the seasons. 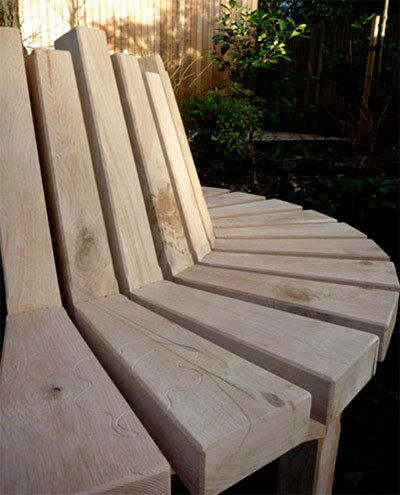 A beautiful bespoke seat was commissioned for around the oak tree creating a quiet place to relax in the summer. Specimen trees were planted to add height and further character. The top terrace is home to the gym and the plant room. 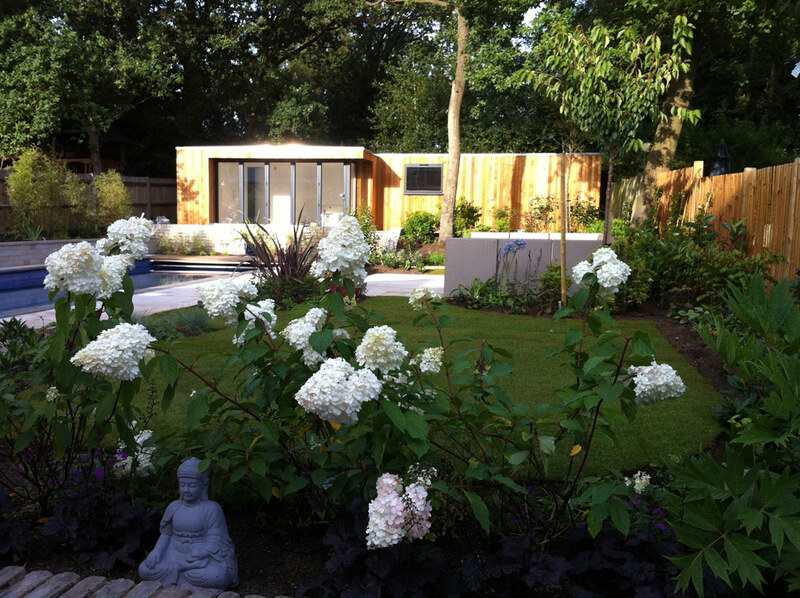 To improve privacy the Rhododendrons were replaced by a new fence on one side and on the other, a raised bed was planted with black stemmed bamboo to create a privacy screen along the side of the swimming pool. 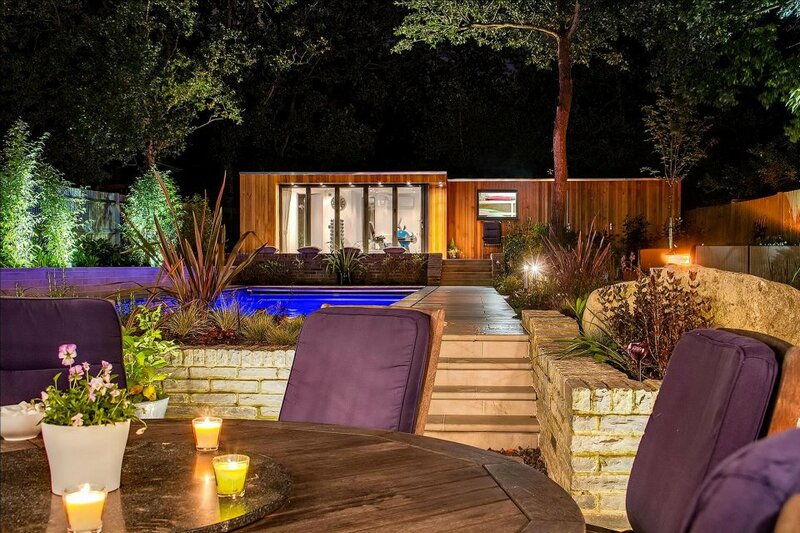 The hard landscaping is constructed from beautifully machined sandstone matching the walls of the raised bed and fire pit and the whole garden is made magical at night with lighting throughout the garden.